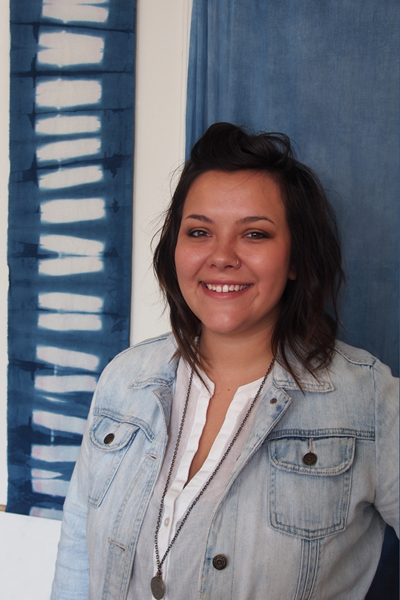 I’m Emilie Didyoung, maker of Stick & Stone Designs. My mission is to create custom textiles that use natural dyes in an attempt to remain conscientious of my effect on the environment. I am always interested in using processes and techniques that have been around for centuries while giving them a contemporary voice. I create all my work in my apartment in the Fairmount area of Philadelphia. I tend to do my work all over the place. I have a space set up in my room where I have my desk, computer, fabric, etc. but I also have to work in the kitchen when working with dyes/mordants that require heat. When the weather is nice, I try to use my little city backyard as much as possible! Bring out my vats to dye in and hang all the fabrics to dry. My apartment is small and unique, just like any old brownstone but it works just perfect for all my maker’s needs! 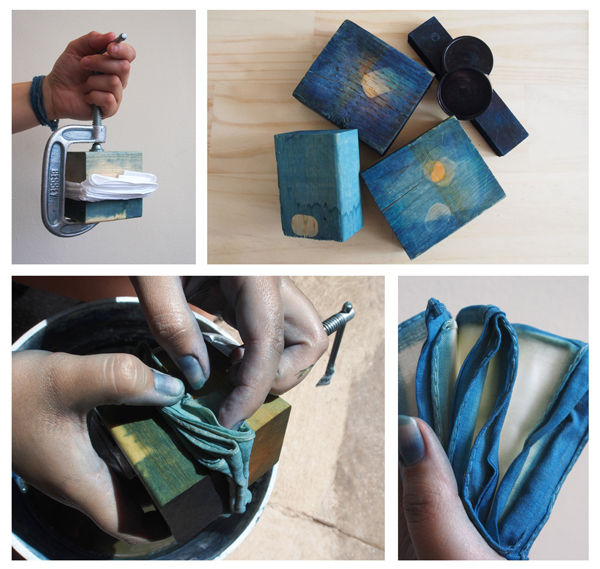 I primarily use natural indigo in my work. There is just something about those indigo blues that always keep drawing me in! I also have a very deep connection to the process of indigo dyeing. 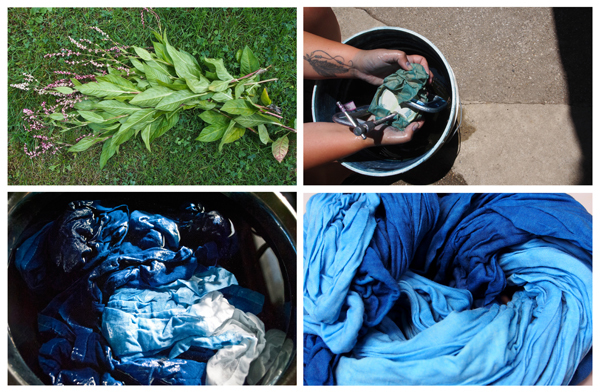 I’ve tried many different forms of dyeing with indigo such as fresh leaf dyeing, a fruit vat, iron vat, fermentation vat, and the vat I use the most—a fructose vat. I also had the special opportunity to experience harvesting and winnowing Japanese indigo and dyeing with the Japanese Sukumo vat. The Art Star Craft Bazaar will be the first time I will feature my new designs in new colors! 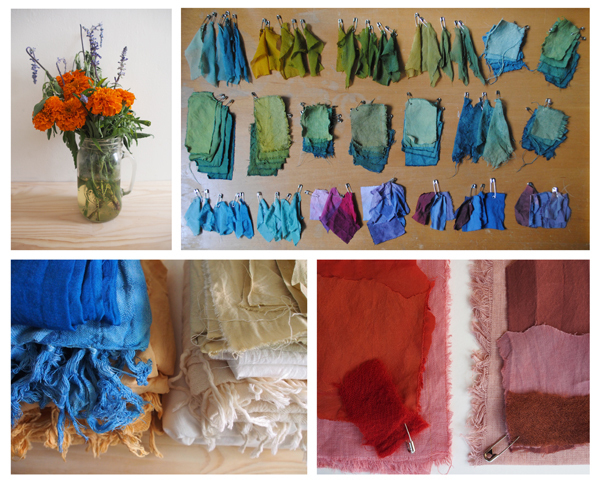 I recently shifted my focus from just indigo to other forms of natural dyes. I have experimented with other natural colors in small amounts over the years but this will be the first time I will be selling products in new colors. Of course I will not be abandoning those indigo blues! My new color ways will be over-dyed with indigo to create a vast array of shades in each product. My new natural color experiments include madder and fustic wood over-dyed with indigo. This will give a striking range of yellows, greens, and teals and a lovely selection of pinks, blush tones, and purples. I’ve also worked with marigolds, onion skins, cochineal, turmeric, hibiscus flowers, black beans, red cabbage, and much more to come! As a surface designer, the design is just as important as the color. I mainly focus on using shibori and dip-dyeing techniques in all my work. I have also worked with resists, screen and block printing. But shibori and dip-dyeing have always allowed me to create that clean minimal look that I always strive for. There is something truly beautiful about creating a pattern just by the folding and binding of fabric. Simple techniques for my simplistic designs. I’ll have a variety of products for the home and some wearable items available. Plenty of indigo and my new colors will be featured at Art Star Craft Bazaar! See you in Asbury Park! This entry was posted in ascb and tagged art star craft bazaar, Asbury Park, Emilie Didyoung, Fiber Arts, handmade, Indigo Dye, meet the maker, Shibori, Stick & Stone Design, textile design. Bookmark the permalink.